Other states escaped plague. Why? In a deadly mystery, Ohio has suffered astonishing overdose death rates from the powerful opiate carfentanil, a disaster that other states did not experience —- not even some in the heart of the overdose epidemic. 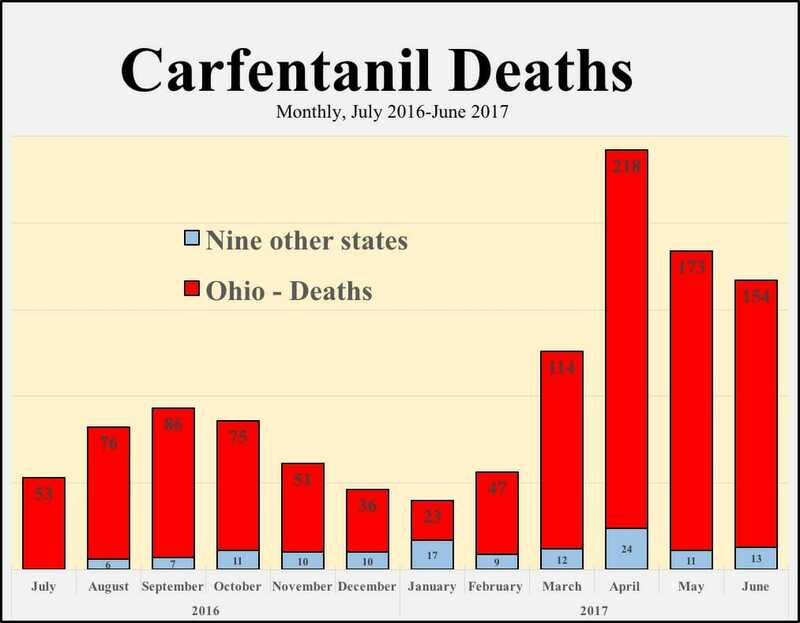 The Centers for Disease Control reported on July 13th that Ohio had an unusually high number of carfentanil-related deaths from July 2016 to June 2017, the period the CDC studied for 10 states. Harm Reduction Ohio reported this finding on July 27th and then obtained the actual data from the CDC. The actual data show results even more devastating for Ohio than imagined. They are close to impossible to comprehend. 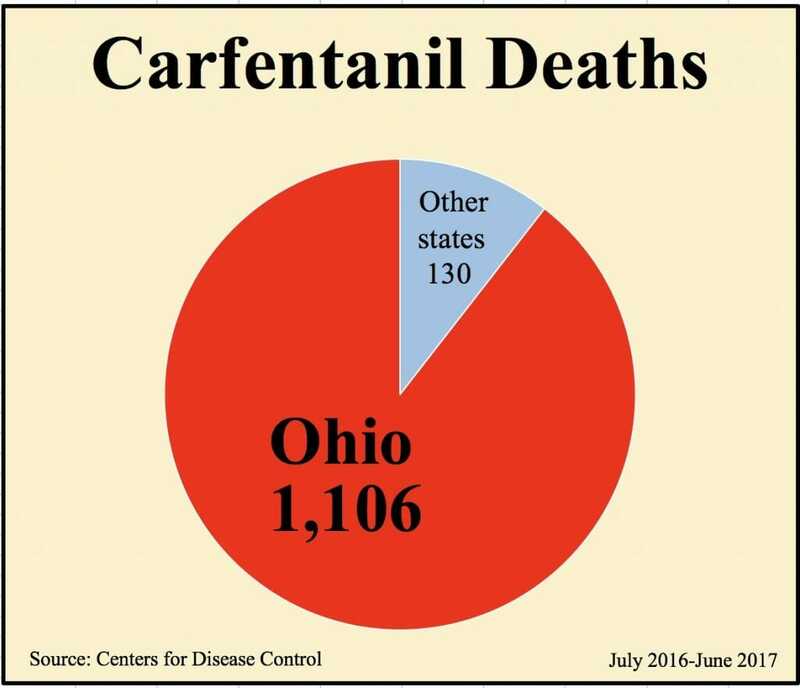 Ohio suffered 1,106 carfentanil-related deaths vs. 130 in nine other states from July 1, 2016 to June 30, 2017. Ohio has a population of 11.6 million. The other nine states have a population of 28.6 million. Ohio’s death rate was 9.52 per 100,000 residents vs. 0.45 per 100,000 in the nine other states. 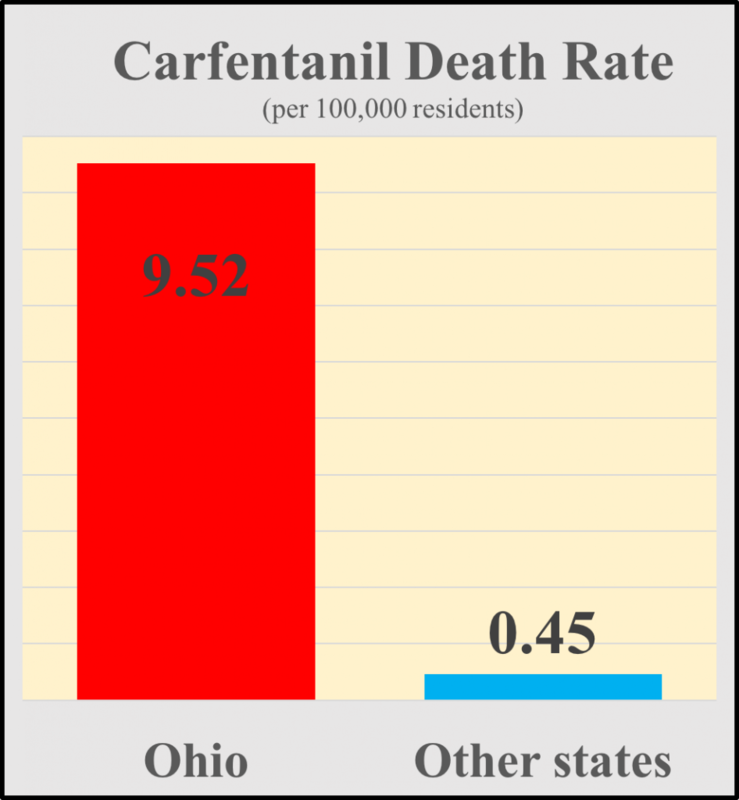 In Ohio, carfentanil was involved in 33% of 3,322 deaths linked to black-market fentanyl and its analogs. In the nine other states, carfentanil was involved in 24% of 531 deaths involving fentanyl and an analog. 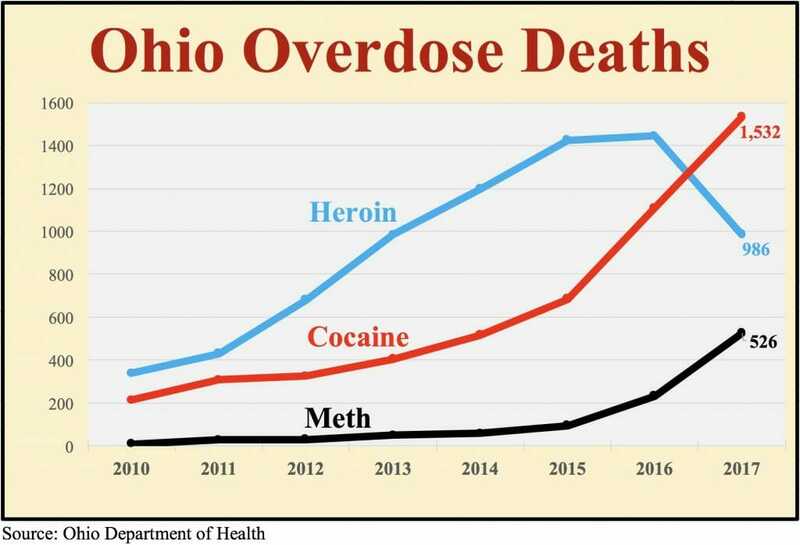 The CDC’s results show that Ohio has suffered a one-two overdose death punch. Our state suffered from much more carfentanil specifically and all fentanyl variants generally during the 12 months studied. The other nine states studied were Kentucky, Maine, Massachusetts, New Hampshire, New Mexico, Oklahoma, Rhode Island, West Virginia and Wisconsin. Two of those states — Kentucky and West Virginia — border Ohio. Massachusetts, New Hampshire, Rhode Island and West Virginia are among the states that have been hit hardest by overdose deaths. The ten states, including Ohio, were chosen for the study because are they are the first to report under a new CDC-funded program to obtain detailed data on opiate overdose deaths. The program — the State Unintentional Drug Overdose Reporting System (SUDORS) — will eventually expand to 32 states, plus Washington, D.C., allowing for a broader understanding of overdose death patterns in the United States. There is no obvious explanation for why carfentanil has hit Ohio so hard. It is possible that coroners in other states are missing carfentanil in great numbers, but this seems unlikely since the CDC is paying states specifically to identify fentanyl analogs, notably carfentanil, the most notorious analog at all. Ohio state government does not appear aware that carfentanil was the primary cause of the state’s massive increase in overdose deaths in 2016-17. The state has said nothing about it. The state attributes the overdose death epidemic primarily to opioid use. The evidence does not support this claim. Opioid use may create a variety of problems, but it should not be fatal. The primary cause of death in Ohio (and elsewhere) is the unpredictable and adulterated chemical make-up of the illegal drug supply. If the state focused on what is actually causing death — i.e., the actual chemicals in drugs taken by 1.8 million Ohioans — it could make inroads into the worst self-inflicted public health catastrophe in U.S. history. 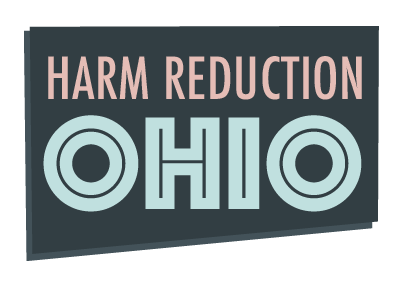 Harm Reduction Ohio identified the cause of a massive surge in overdose deaths in a special report earlier this year by conducting a statistical analysis of more than 100,000 drugs confiscated by law enforcement in Ohio and tested at the three state crime labs. The pattern was clear: Carfentanil-adulterated drugs — especially cocaine and meth — were driving overdose deaths. This explains why the state’s exclusive focus on opiate addiction is ineffective at limiting overdose deaths: it misunderstands both who’s dying and why. Why they’re dying — from an earlier Harm Reduction Ohio report. Better Narcan distribution. Ohio has poor distribution of the opiate overdose-reversing drug naloxone. While other states encourage private groups to distribute naloxone, Ohio essentially bans it, keeping distribution in the hands of public health departments and medical providers who don’t easily reach vulnerable populations. It also relies heavily on naloxone devices that need to be assembled before the drug is administered and deliver too small a dose (2mg vs. 4mg) to reverse the effects of today’s fentanyl analogs, especially carfentanil. Better drug checking. The state needs to begin immediately providing anonymous testing of illegal drugs so users of all drugs — opiates, cocaine, meth, pills, psychedelics, marijuana and more — can be understood before they cause an overdose. A total of 1.8 million Ohioans use illegal drugs every year, so the risk of overdose death crosses every social and economic class and involves every family. Better drug reporting. Both state and local governments need to report promptly the results of all gas chromatography–mass spectrometry (GC-MS) done on confiscated drugs at crime labs. Currently, test results are used only to prosecute individuals and not ever reported publicly, much less promptly. Lab results are important public health information, not police secrets. The good news is that overdose deaths in Ohio appear to have dropped since July 2017. The decline in deaths coincides with a decline in the share of Ohio’s illegal drug supply that contains carfentanil. 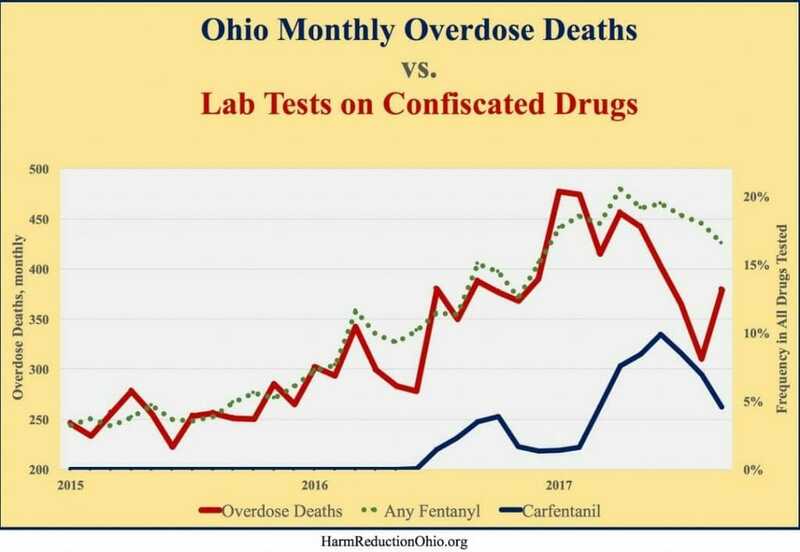 The downward trend in carfentanil and deaths — and the upward trend before it — had nothing to do with policy actions taken by the state of Ohio. Indeed, the CDC’s early numbers indicate that other states appear to have experienced significant declines in overdose deaths long before Ohio Ohio’s modest drop began. The government’s policy of drug prohibition creates large, unregulated drug markets in which unpredictable purity and safety is the rule, not the exception. Prohibition kills. Always has. Always will. Is doing so right now. In the short term, paying ultra-close attention to the chemical composition of illegal drugs is the best practical way to prevent overdose deaths. Drug users don’t deserve to die because government forces them to be ignorant about what they consume. “First, do no harm” has never been a more apt maxim. There are two key components missing from Ohio’s inept attempt to stem the tide. Education for both the public and the lawmakers. Rehab programs to treat the problem. Sobering up in jail is not the answer. Arresting addicts solves nothing. Arresting the dealers and their bankers would be far more effective.